The elves and my hands are still a bit fickle, so I am embarking a solo effort. Dirigibles must be produced and the Hawk 1/245 scale Graf Zeppelin is still out there, begging to be bought and used in some service to our game. While not a correct scale nor true profile for us, it is still usable if adjusted, so here we are . . . The kit can be had for under $100, this one was secured for $30 off eBay recently. This will require a new nose plug, later. Thankfully the tail feathers are not molded to the hull, but the gaps and mounting flanges will need some attention, later. The engine and crew locations and designs will need changing, nice the control cabin is also an add on, like they had made it possible to convert . . .
Yikes, that’s a lot of conversion work! Good luck, can’t wait to see the finished results. Ambitious project. Yes, please, do post the documentation to the 'drome! Had one of these gifted to me at one of the early Doncaster events. Fun kit especially adding the lighting to the gondola. Got through a lot of silver paint though. Looked great on window ledge before a combination of cat and five year old got to work... sob ! Sorry to hear that Chris. Guess that means you are a Zep down then. Hope you kept the wreckage! We are adept at recycling fallen balloons! Before you start gluing the hull bits together the first step needs to be the base! Find, steal, cut a 10" length of 1 x 4, square up and smooth sand it well. Next procure a pair of telescoping magnetic tools at the local car parts place. They run around $3 each. On the way home stop in at a party store and buy some balloon sticks, heavy plastic straws that should be a slip fit over the smaller extension of the mag tool. Measure the base diameter of the mag tool, select a drill bit to match. Mesure the notches on the center bottom edges of the hull, these will become the attachment points for the stand. Mine measured 5 1/8" center to center. Holes are drilled on center and mag posts installed. Balloon sticks cut to length, an anchor strip is drilled to match the balloon tubes on the same 5 1/8" centers and slip fitted into the top center as shown. Do the elves seal the base immediately after fitting the mag tools, or not until the rest of the project is done? These guys did . . . they were doing several other projects at the same time . . .
Once the base is realized, test the two halves of the hull for fit, you will need to file the notches deeper so they fit closed. Next the fins and rudder filler bits need to be cut out of light 1/8" plywood, use the drawing enclosed, enlarge and print off full scale. Before you can fit the fins you will need to saw the existing rudder mounts off the hulls. A razor saw or scroll saw can do this, sand the edges smooth. The rudder fillers can then be trimmed for a nice tight fit, glue in place and sand flush. Nose plug needs to be filled so it can be ground to its new shape. Fins can be fitted next. Final fitting before the big glue. And its nearly done! Lots of tape and rubberbands! While the glue cures the nacelles get sorted. Three from the kit and two from scratch. Last edited by clipper1801; 03-19-2019 at 21:49. So we call in the painting elves. Flat white the top . . .
Cured and masked . . .
Flat black . . . Taking shape very well Dave. I hope to be able to move the final to the "How to" forum. Did some stippling along the color line like in the photographs of the real one. Then added the nacelles. Top and rear guns next up . . .
And we are off to the land of cards! Not bad for mostly out of a box! Last edited by clipper1801; 03-20-2019 at 17:23. Wonderfully helpful guide for do-it-yourself! Thanks David! Magnificent work, David - you are always an inspiration Such a classic look, indeed. No, the rocket is similar, but I found it languishing in an art bin in a craft store years ago missing a fin. Rescued it for a buck, made into a fun decoration for my 4th childhood bed room . . .
Building Dirigibles (Airships) from scrach. Building the R-34 and the L-11. 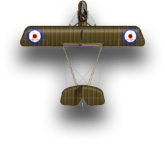 Building a DH2 - HELP!!! !